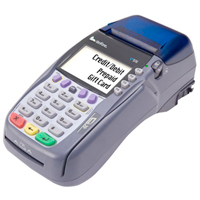 The Vx 570 provides merchants with future-proof connectivity. It has built-in support for dial, and an option of combining dial and Ethernet. Dial can be used today, then switched to Ethernet at any time without added cost or inconvenience. Or merchants with broadband service already installed can immediately process payments through the always-on connection. Smart and stylish, the Vx 570 has an intuitive, ATM-style interface and bold menu prompts to reduce help desk training time, support and costs. And its anti-glare, white backlit display provides exceptional readability. Plus, a USB memory drive allows for instant software downloads.